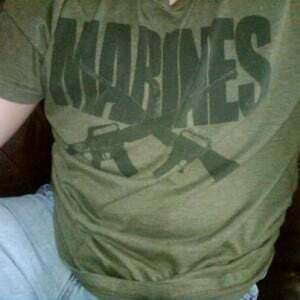 A middle schooler at Genoa-Kingston Middle School in Illinois was told to remove his US Marines T-shirt at school. The boy was told it was against the school code. Today a Genoa-Kingston Middle School student’s parent is claiming that a teacher ordered his son to cover his US Marine themed t-shirt or be suspended. Dan McIntyre says that his son Michael has wore the shirt to school many times in the past and that he is a big fan of the branch of the US military. Dan McIntyre says that, “A teacher noticed the guns on the shirt.” He went on to say that the teacher said there was a school policy against the image of a gun. Michael complied when the teacher asked him to turn the shirt inside out. However, Dan says that his son was still reported to the schools principal. Now children can’t even support the military without getting a suspension. More… The Genoa-Kingston school dress code states that students clothing cannot promote “violent behavior” which is the only vague rationale that could be used for having Michael cover his Marine shirt.